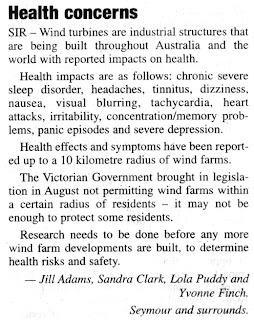 "When anti-wind farm leaders move around communities, sometimes with entrepreneurial lawyers, spreading anxiety that the turbines can harm heath, we can get a potent combination of poorly informed, worried and angry residents seeded with the idea that their protests might lead to a payout." 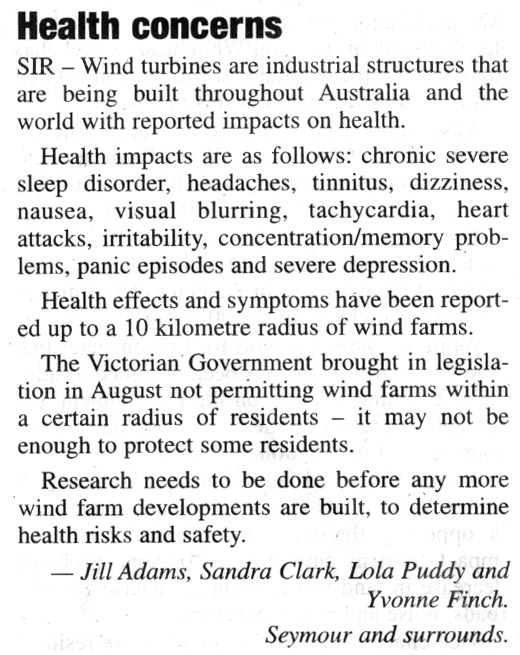 He goes on to say "Fortunately, anti-wind farm voices in the bush are in a small minority, as this CSIRO study shows." The danger in responding to the unsubstantiated claims of health issues, like this, is that one might appear to lack concern for locals welfare. This is certainly not the case. What I've done in this letter to the editor is to look at the big picture and not get dragged into a crazy argument that further divides the community. I'm interested to see what response I get. It's become clear that the human race cannot continue to extract fossil fuels at the current rate. At the same time demand for goods, food, water and energy is increasing along with the population. How are we going to maintain a high standard of living as resources continue to diminish? First and foremost we need to reduce our own personal energy use. The typical Australian household uses around 16-20kWh per day. This can quite easily be reduced by switching lights and appliances off (at the power point) when not in use. We can also make more efficient use of electricity by generating it closer to where we use it. Just as we see individual households doing this with the installation of solar systems we can do this on a regional level by adopting larger scale renewable systems, like wind energy - which uses less resources to construct than solar PV for greater returns. There is no doubt that clean energy sources like solar and wind have an affect our environment, but they are far less damaging to the earth than fossil fuel based energy that also pollutes, contributing to climate change. While renewables are a BIG step forward in reducing our impact on the planet, the most effective way to reduce your ecological footprint is to grow your own food. That has whole multitude of benefits, not just for the planet, but for your health too.